Do you remember the day when you were suddenly given the option of ‘near me’ on Google searches? Me neither. But it’s a feature that’s become one of Google’s most enticing. Being able to target specific industries within a physical distance is something of a modern marvel. And we all love it. Google has gone one step further with their newest advertising addition: Local Service Ads. Local Service Ads was launched in 2015 but were largely unknown until the service was offered outside of California for the first time last year. Since then, Local Service Ads has quickly claimed the title of Google’s most prestigious real estate. Why? The ads appear above organic and regular paid search. And instead of going to a website, you can instantly message or call the business instead. 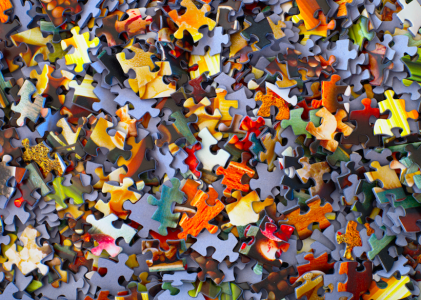 Let’s have a closer look at why Local Service Ads are skyrocketing in popularity, and how you can jump on the bandwagon. Local search metrics are staggering. 75% of local searches turn into in-store visits within 24 hours. More people are looking for a way to get answers and help from brick and mortar businesses — and fast. Getting a piece of the local action could mean a significant amount of customers either calling or visiting your store. The whole idea of Local Service Ads is to focus on brick and mortar businesses in your area. 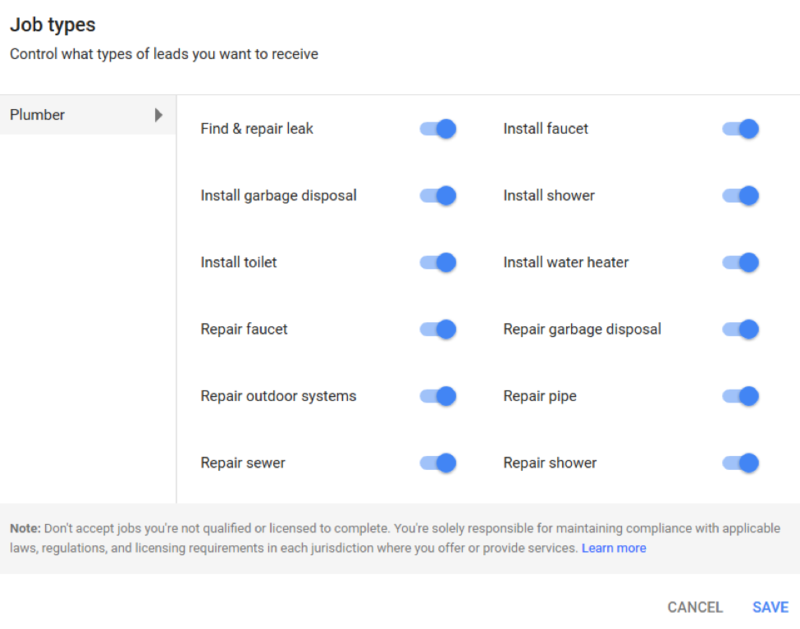 The ads are a great way for you to get more traffic from Google if you are say a handyman or a plumber, but not so much if you’re selling online products. 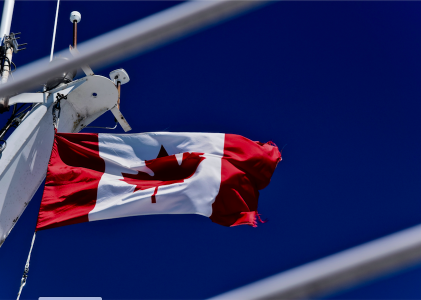 Currently, Local Service Ads are only being offered in the US, Canada and the United Kingdom. It’s the early days though, so if you don’t live in one of those countries, be patient—it’s bound to expand soon. 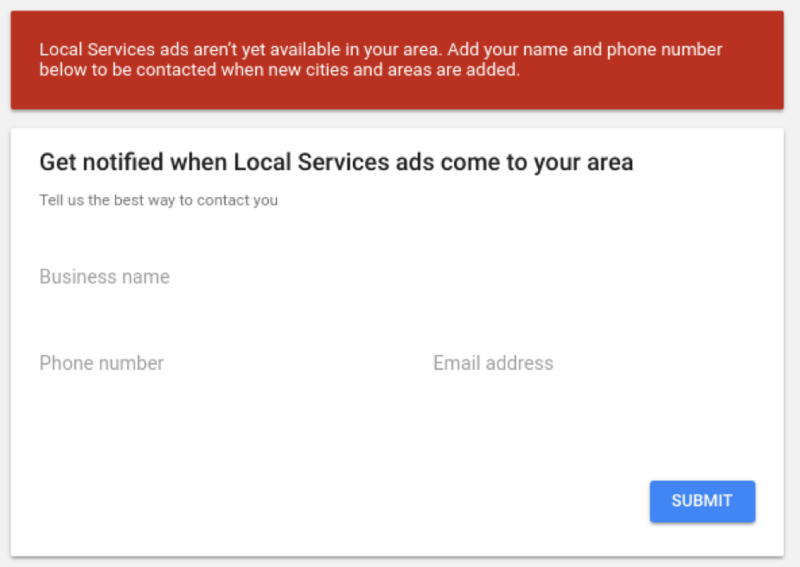 Industries marked with an asterisk are only available in certain areas, but this is expected to change as Local Service Ads continues to expand. But, FYI, you must pass rigorous checks to be able to use Local Service Ads for your business. These include passing a criminal background check, having valid liability insurance and proving you have the correct licenses to be able to carry out work in the first place. You can do the check yourself here. These checks are needed not only for business owners, but also to ensure any field employees (such as independent contractors or temporary workers) are legally employed by the company. 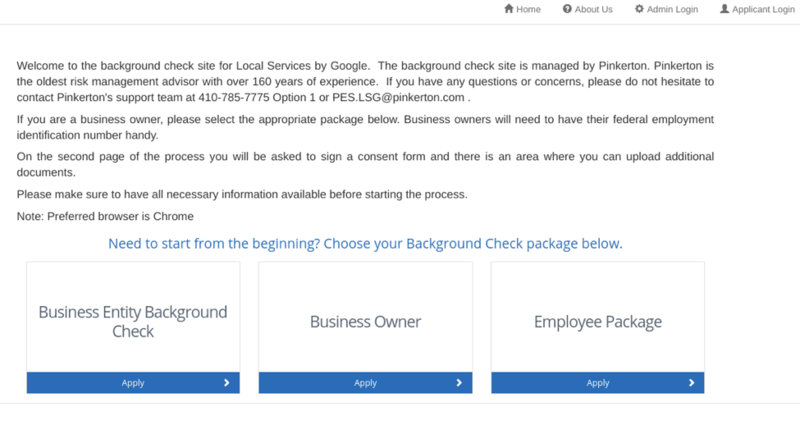 Although it’s a basic background check that only covers serious offenses, if your business fails any part of it, it will not be allowed to advertise through Local Service Ads. To verify that you are a legitimate business operating with proper insurance, you need to prove to Google that your liability insurance is up to scratch. 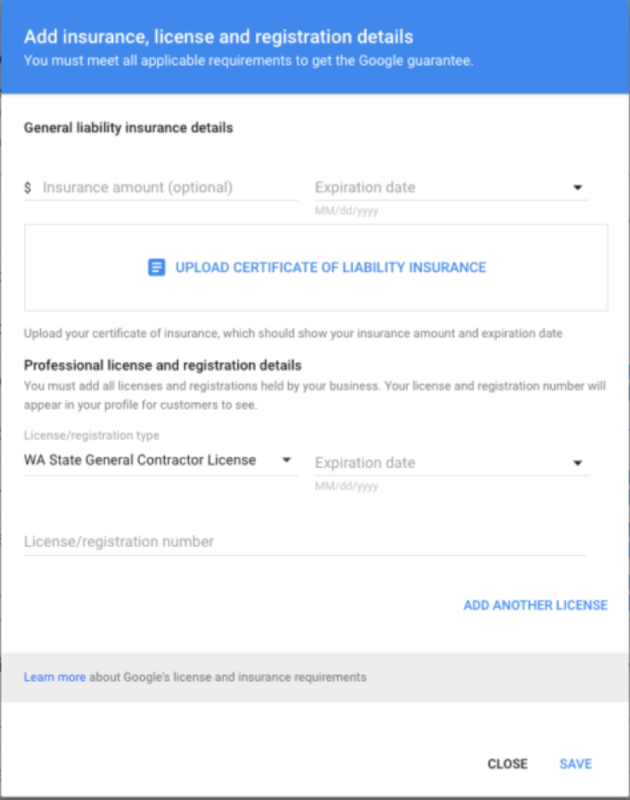 On top of your liability insurance, you must also prove to Google that you hold all of the necessary licenses to carry out work in your industry. 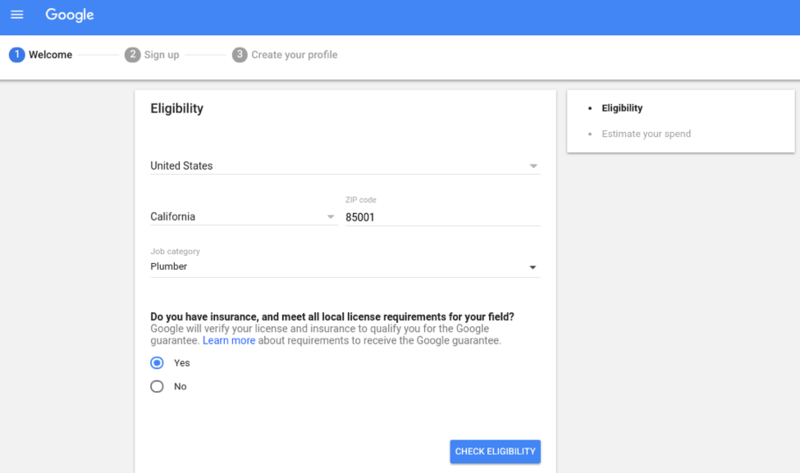 For example, if you are applying to advertise your plumbing business, you must upload your plumbing license and any other credentials you hold before Google makes a decision on whether or not you can advertise. If you don’t pass these checks, you won’t be able to advertise on Local Service Ads. If you fail the first time, you are given a second chance to re-apply within 30 days. If you fail that, you are banned from attempting to advertise on the platform for a year. Much like Google Ads, you must still set your budget on Local Service Ads. But how you are charged differs a lot from Google Ads. Because you are only charged for ‘valid leads’, you generate a more predictable ROI (based on customers, instead of someone just checking out your website). Similarly cost-per-lead varies depending on your industry. One of the great things about Local Service Ads is you’ll only get charged for leads that Google deems are getting you legitimate business. If it turns out one of your leads isn’t valid, or it’s a spam call, you can then dispute the charge with Google who will process it within one week. It doesn’t always go your way, but it’s definitely worth looking into if your leads aren’t converting into clients. If Google determines your business isn’t right for the job, you won’t appear in the results. 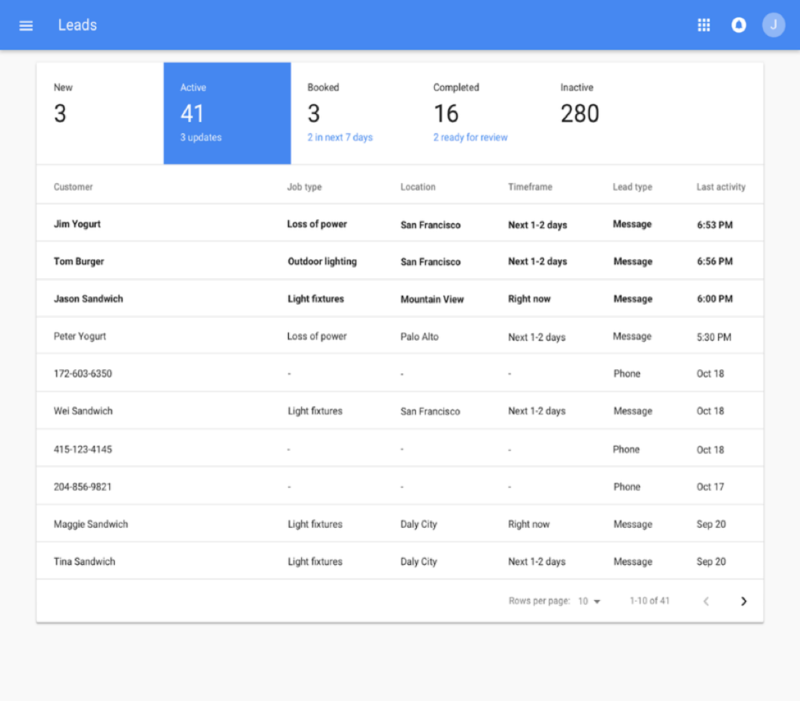 This feature saves you calls and messages from people who are looking for something that you don’t offer, and increases your chances of finding a more suitable client when your ad ranks for what you do offer. This provides a more targeted approach than a regular PPC ad, where you may end up paying for clicks from unqualified customers. If determined to be a good match, your potential customer will be able to look at your qualifications, reviews and ratings before they make the decision to contact you. This added social proof increases your chances of closing the deal. 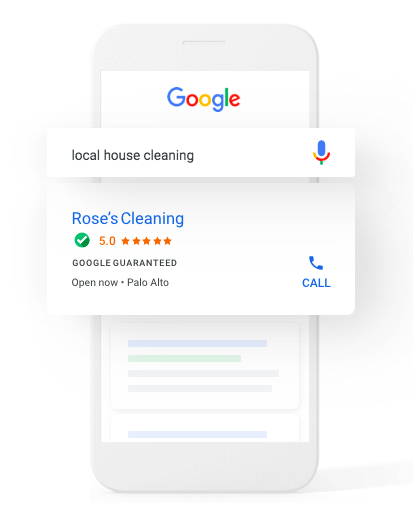 Google is also trialing Local Service Ads using Google Assistant, meaning people will be able to use voice search to ask for a service. 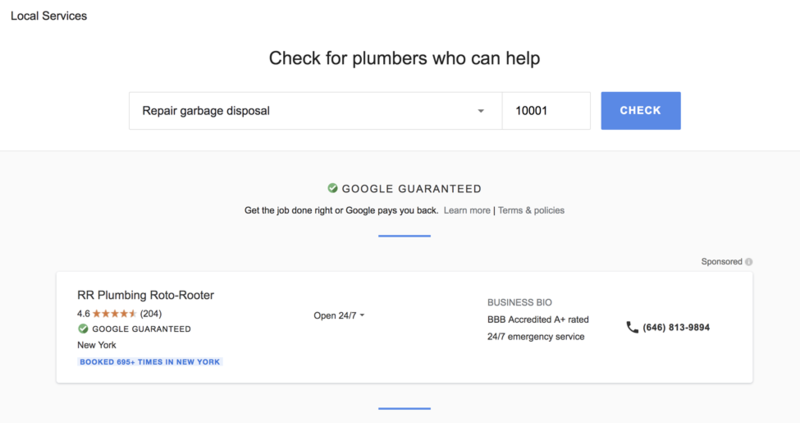 As this service is currently in its testing phase, Google is inviting businesses to participate for free. The only catch is you have to pass the same checks as if you were signing up for regular Local Service Ads. You can sign up here. Just like Google Ads, your Local Service Ads must tick a few boxes in order to rank in a decent position. Your ranking is determined by several factors, your budget, how close in proximity you are to the searcher and how many positive reviews you have. But to get high on the rankings, you must be proactive towards your Local Service Ads. Google tracks several elements when ranking your ads, including how long it takes you to respond to customer queries and whether or not you are getting positive reviews. Even if you end up declining a lead, Google will document if you don’t respond to the lead in a timely manner. In fact, your rankings will drop if you’re slow to respond to messages — or worse, if you don’t respond at all. 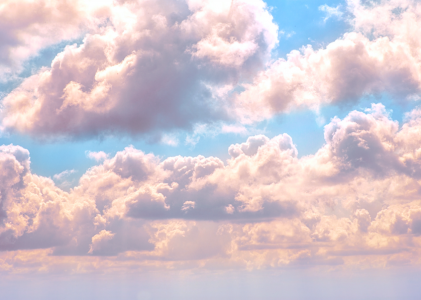 The silver lining to passing all of Google’s vigorous tests? You become a “Google Guaranteed” business. 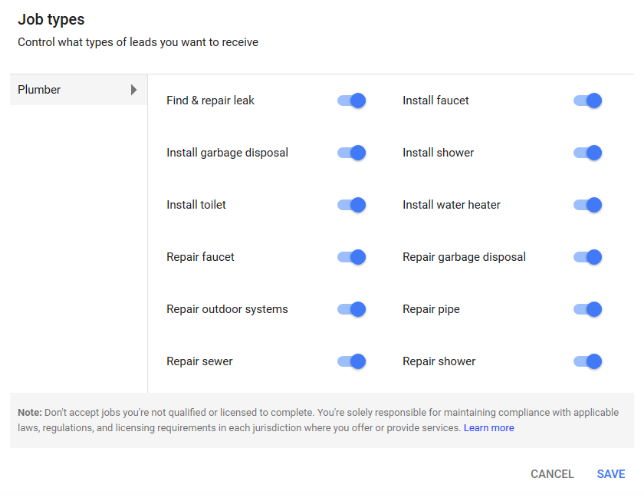 Google is so confident in Local Service Ads that if customers aren’t satisfied with the end result, Google could refund up to the amount paid. Each Google Guaranteed Business is given a lifetime cap for refunds of $2000 — which is a pretty decent sum. Searchers will also know you’ve been guaranteed by Google with an eye-catching and confidence-boosting green tick. Although there’s not much difference between the two ad services at a surface level, they’re pretty much chalk and cheese once you start looking closer. To ensure legitimacy, putting up a Local Service Ad for a locksmith business requires vigorous checks to weed out any scammers. In fact, that’s the whole reason Local Service Ads started in the first place—to stop scammers from advertising on Google. While Google Ads brought in 37 billable leads a month, Local Service Ads were able to add 102 billable leads to the company’s bottom line. In simple terms, Local Service Ads gave their customer 175% more leads than Google Ads. And the latter was 182% more expensive. Not bad for a third of the price. Once you’ve assigned your job types and uploaded all your insurance and licence paperwork, your profile will be complete. Only then can you start your own Local Service Ads and start to gather leads. An important part of Local Service Ads to keep in mind is that a lead doesn’t mean you’ve actually landed the job. It’s a step in the right direction, but you still need to close that customer yourself. 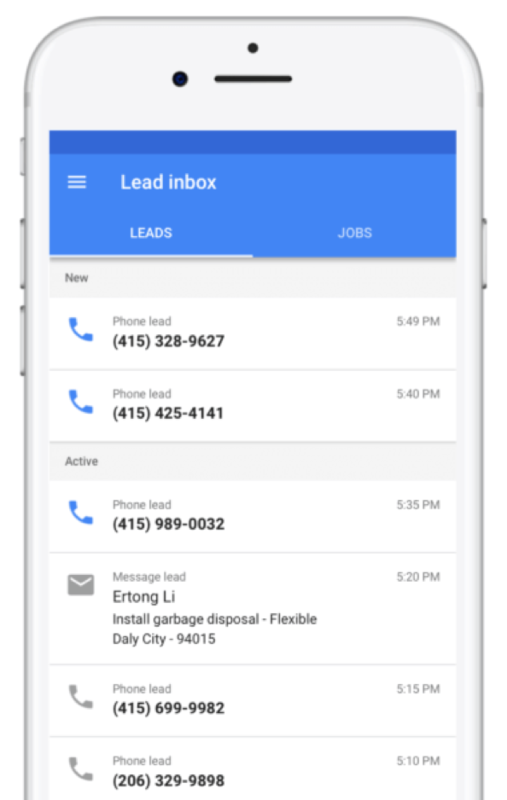 To make sure you keep on top of communications with active leads, Google has released an app specially for Local Service Ads. The app will notify you of any messages or calls, along with new messages from other leads. Pro tip: Once you’ve locked in a customer’s job, mark that particular lead as ‘booked’. Not only will this keep you organized, but it will optimize your ability to determine the overall ROI of your Local Service Ads campaign. We recommend going for it with reviews and being diligent about collecting them, particularly when starting out. They play a huge part in your listing, and if you are an established business, you shouldn’t have a problem bringing in reviews as long as you make it a part of your early advertising strategy. To start collecting reviews, click on the ‘reviews’ tab in your Local Service Ads dashboard and click the ‘ask for review’ button next to the relevant job. To get the most out of your reviews, we recommend personalizing the message you send to your customer. Not only will this increase your chances of them actually leaving a review, but it could also be a nice way of leaving the door open for future business opportunities. If you already have some verified reviews on Google, they will be combined with Local Service reviews as the platform develops. And if you are worried about what will happen to your reviews if you leave Local Services — don’t be. The decision of whether you are charged or not for a lead is directly related to your lead call time. 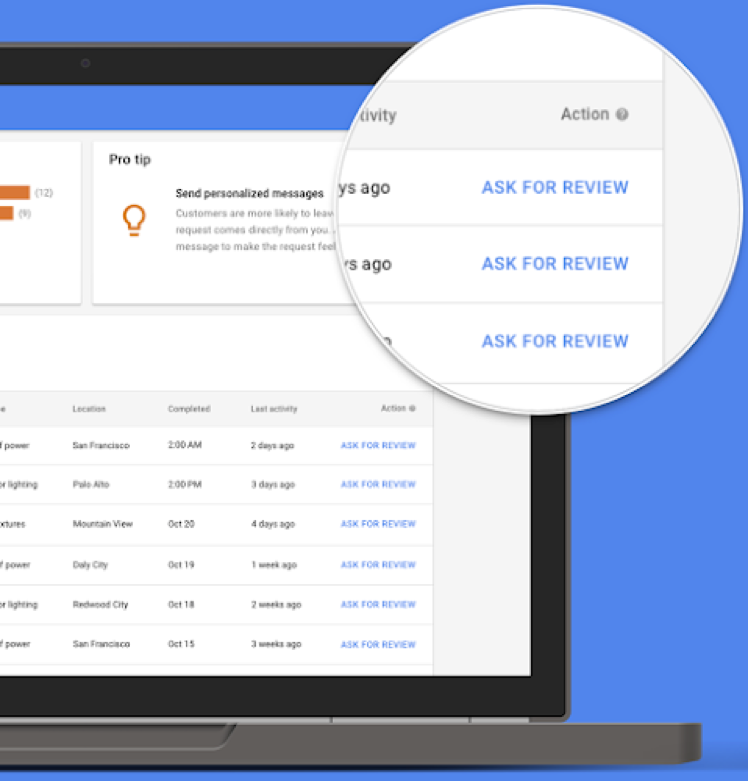 That’s right: Google is keeping tabs on your phone calls. And if you go over a certain time, you’ll be charged. Which is fine if the lead is genuine, but if someone has contacted you to ask a bucket load of questions without booking your services, you’ll be paying out of pocket. The exact timeframe of when you’ll be charged for a call is ‘internal information’, but one thing is for sure: you won’t be able to dispute a timewaster. Ask the right questions: Find out as much information as quickly as possible. For a plumber, this might be asking about the “symptoms” upfront e.g. hot water not working. Lead them to a specific goal: Once you know what they need help with, tell them what the next steps are. Do they need to be contacted by another member of your team, or does somebody need to visit them. Act like a doctor and give them a prescription. Get their details: With the diagnosis in hand, get their name, phone number and any other pieces of information. Ascertain any pieces of information, such as callback times, and then thank them. We’ve shown you the advantages of using Local Service Ads in your advertising plan, and the ROI figures look exciting. 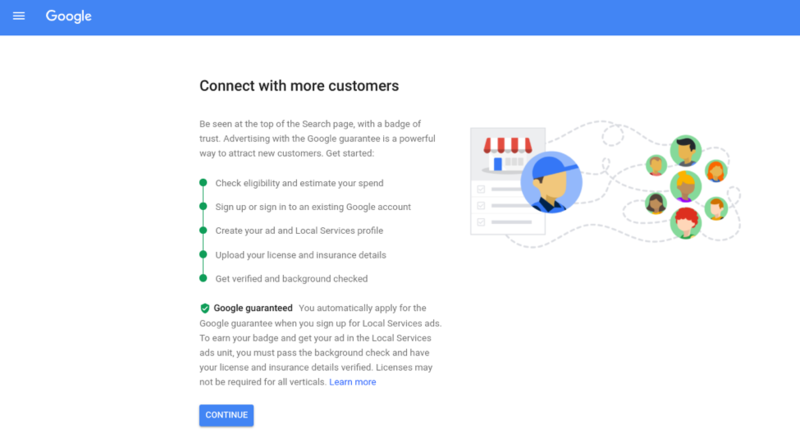 Through better customer targeting, increased security checks and higher positioning on Google’s homepage, the service looks like it could be a win-win for both businesses and customers. However, don’t pull your Google Ads budget. We recommend drawing out some of your current advertising spend with Google and putting it into a Local Service Ads campaign to test the waters. It will take time to get used to the platform and, if it’s not for you, it’s better to have your Google Ads campaign running in the background to maintain your advertising presence. And if Local Service Ads are yet to launch in your area for your service—you can sign up now and be one of the first businesses in your local area to take advantage of the new platform.